Zero commitment. Zero upfront cost. Zero risk. VTSL enables business centres to maximise their telecoms profitability, and relax with an experienced provider that makes day-to-day life easier. Our full-service offering, clever commercial model and pioneering technology make us a clear choice for any centre wishing to get ahead. 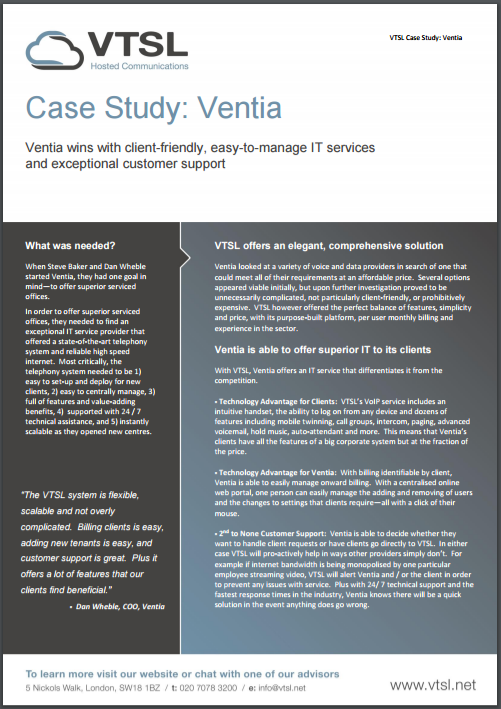 VTSL has been providing business centres with IT and telco solutions since 2007. Our state-of-the art telephony solution offers the capabilities tenants need, at a price they can afford. With no risk, no upfront cost and a system designed to make IT & Telco management easy, VTSL is a smart choice for business centres in the UK and Ireland.